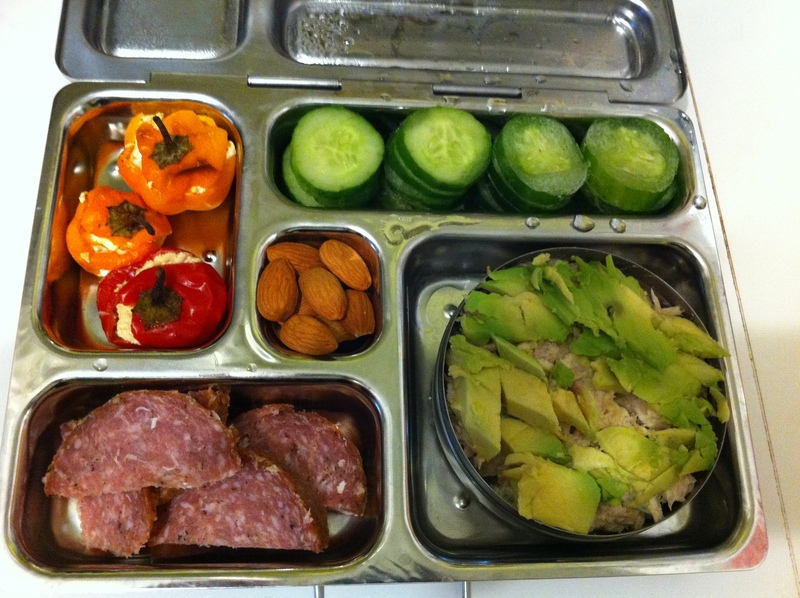 Lunch Box 2: Stuffed Mini-Peppers…buuuuut…. 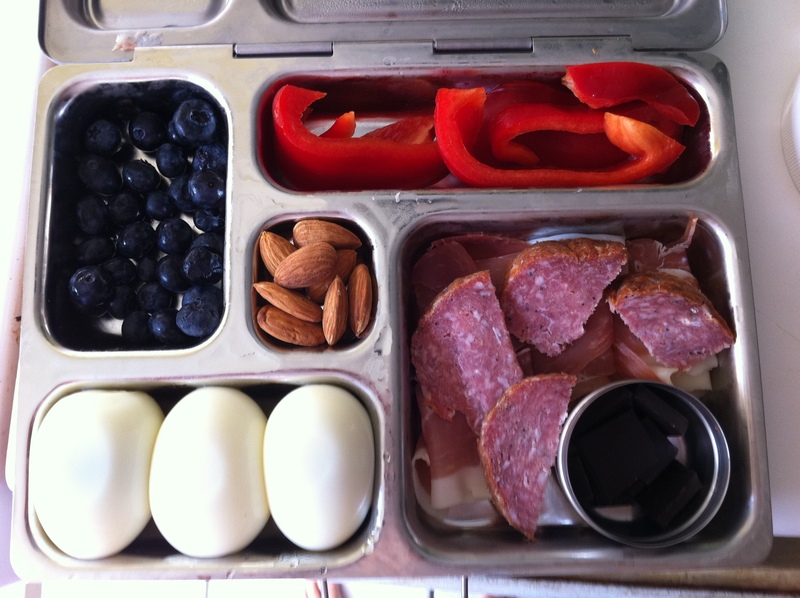 Today’s lunch box had a fatal Paleo flaw…NOT. ENOUGH. FAT! It was a short day (only 6 hours out of the house), but I was hungry. Really hungry. Like, ‘must-eat-now-grabbed-a-dark-chocolate-bar-and-ate-three-squares-on-the-way-home’ kind of hungry. Like (dare I say it?) low-fat, high-carb, ‘back in the day’ hungry. I despise that feeling. I thought the 1/4 avocado that topped my tuna would do the trick, but I think with what I assume was an insulin spike from the sheep’s milk cream cheese, it just wasn’t enough. I think that one is obvious. I was left hungry. The mini-peppers were beyond delicious. We had them for dinner last night along with a grilled wing steak from our quarter of a grass-fed cow that we bought at the beginning of the summer. They tasted *almost* as good cold the next day. While I was eating my boring tuna I was having big regrets. I should have mixed in way more veggies and topped it with plain olive oil and balsamic instead of using mayo. Next time! Some nights we have leftovers. Most nights we don’t. Since my daughter refuses to eat anything other than eggs, fruit and cucumber at the moment, we generally just cook dinner for two once she’s in bed, and we usually eat it all :). Today’s lunchbox was leftover-free, and took me about 60 seconds to throw together. Today’s lunchbox was a ‘long day’ lunchbox as I was out and about (commuting and at school) for over 9 hours, so it was a pretty full one! I stayed full. Almost too full. I ended up eating the lunchbox in chunks and ended up with one egg and a couple chunks of chocolate. I wasn’t jealous of the girl sitting next to me in my first class eating the greasy and delicious-looking slice of pizza, or even the girl in front of me with the 300 grams-of-sugar smoothie ;).